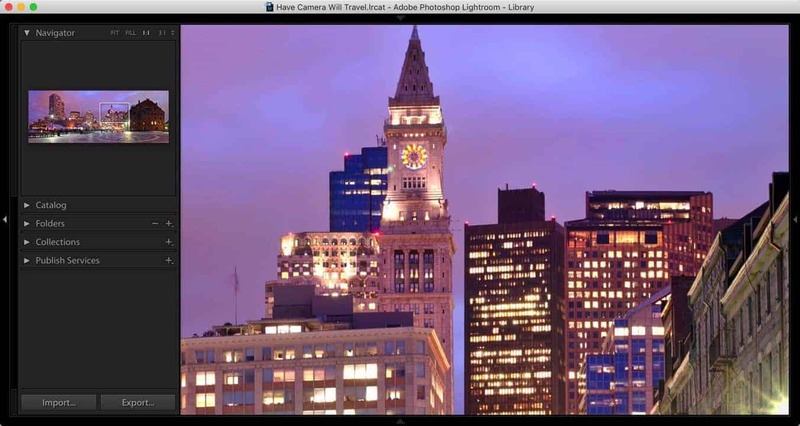 Zooming in to take a closer look at your photos is one of the core functions of Lightroom and is something you'll might be doing hundreds of times in an editing session. 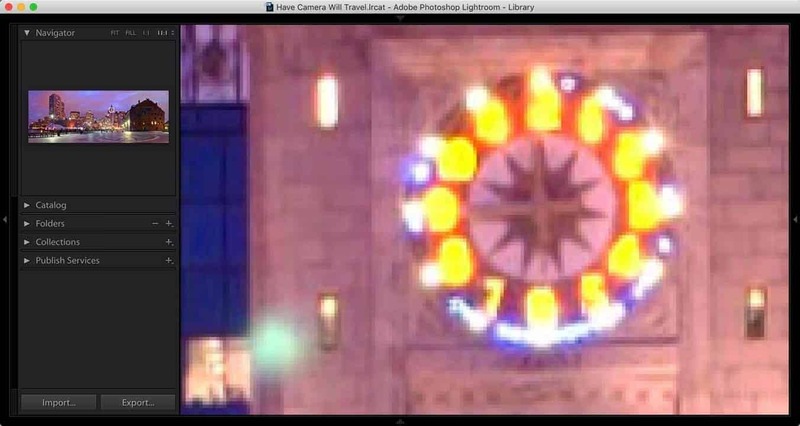 Maybe you want to see whether the photo is tack sharp. Or you might want to look at a specific detail like if someone's eyes are open or closed in a group shot. Or you might want to see how much image noise there is in the shadows. 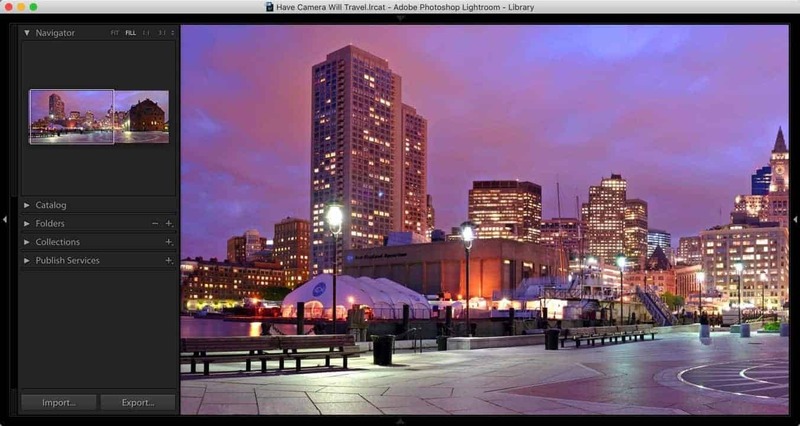 Even with a large display, you'll almost certainly find yourself zooming in frequently. 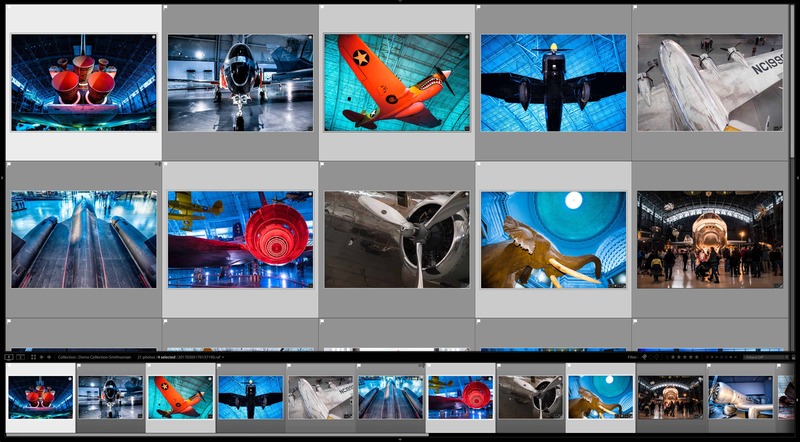 On the one hand, zooming in on photos in the Library and Develop modules is incredibly simple and intuitive. Either click somewhere on the image or press Z and it'll immediately zoom in. Click or press again to zoom back out. On the other hand, there are a number of controls you can use to get finer control over the behavior. For instance, you can change the level of zoom. Or change the framing of where it zooms into. 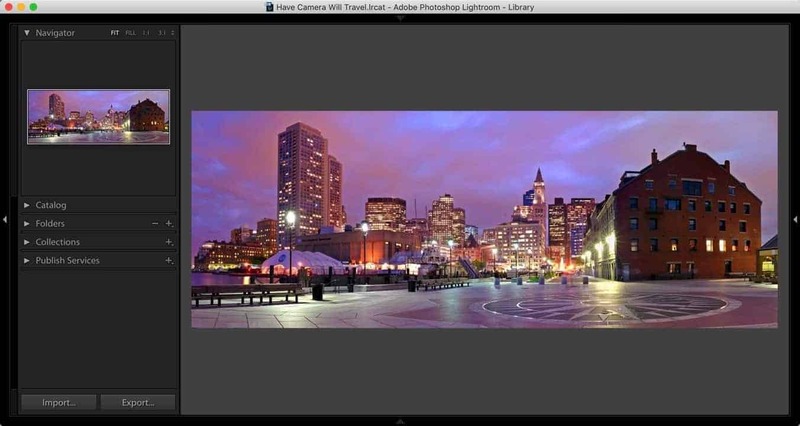 So while it's not particularly complicated, it's also worth laying out here what the various options are so that you can make Lightroom work behave in a way that works best for you and your workflow. These apply apply in the Loupe View in both the Library and Develop modules. The Loupe View is the standard single-image view, as distinct from the multi-image Grid View. There are different ways you can zoom in and out. One is to click somewhere in the image in the main panel. This probably the most intuitive. A second option is to use the keyboard shortcut Z. That toggles the zoom view based on the presets described below. A third option is to use the keyboard shortcuts for cycle through the active zoom modes: to zoom in hit CMD + (Mac) or CTRL + (PC). To zoom out, it's CMD - (Mac) or CTRL - (PC). 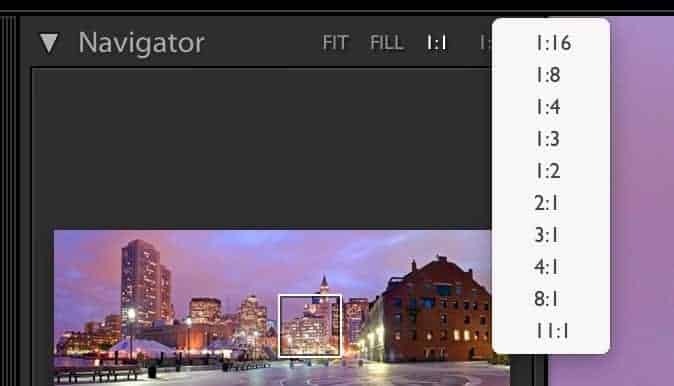 One option isn't available, and it's a behavior you might be used to from other apps like Photoshop, and that is using a mouse's scroll wheel, touch pad, or a vertical swipe on an Apple Magic Mouse. In some apps, that commands an incremenetal zoom. 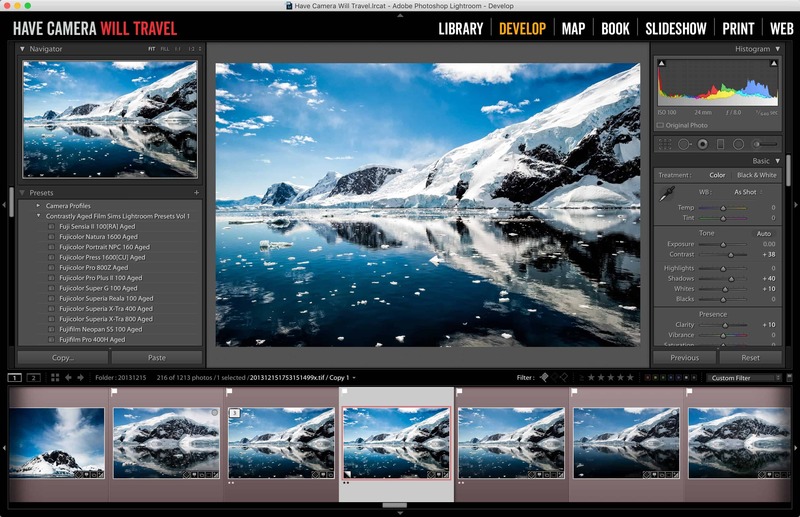 But that works differently in Lightroom, either scrolling through from image to image (in the Library module) or controlling options for individual tools in the Develop module. When you're in the Loupe View, the Navigator panel will be visible at the left of the screen. If all of the left panels are hidden, make sure to expand them by hitting the small triangle at the far left of the screen, or press the TAB key. You'll see four small options visible, starting with FIT, FILL, 1:1, and then another ratio to it's right. They're visible even if the Navigator panel is folded. All of these control the amount and type of zoom magnification, but it's useful to think of them as two groups that behave differently, but they also work together. The first grouping includes Fit and Fill. These are the settings that control the zoomed out state. Fit puts the entire image within the bounds of the visible display box and makes it as large as possible while still keeping the entire image within those boundaries. To exaggerate the effect, I'll use a panorama to illustrate. Fill makes at least part of the image fill the full area of the visible display box so that there's no blank space in that box. In many cases, that means that you're only going to see part of the image. Here's an illustration using the same panorama. If you have the Navigator panel expanded to display the thumbnail, you'll also notice that there's a white box on top of the thumbnail. That's showing which part of the image is visible in the main panel. We can put that to use later. You can customize whether the active zoom out state is fit or fill simply by choosing one or the other--that sets the state for the next time you zoom out too. 1:1 This is displayed as a permanent menu option. 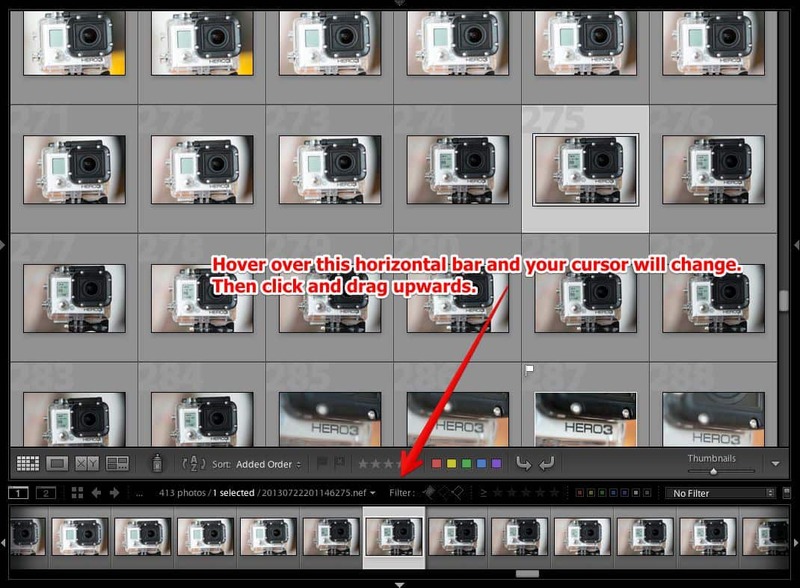 That is, 1:1 will be visible regardless of what zoom in setting you assign (see below). It zooms in to full resolution, where 1 pixel of the image is 1 pixel of your screen. 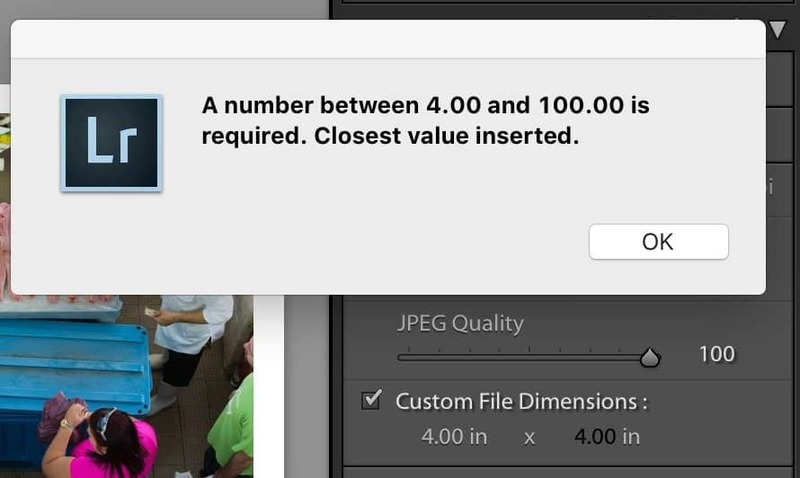 Or, put another way that many (or most) other image editors use, this is the 100% setting. If you haven't already generated 1:1 previews, it might take a moment to generate a new preview image to display. The last option you'll see is actually customizable. If you click on the ratio itself it zooms to that in the main panel. But just to the ratio's right is a small dop-down icon. Click that to access the options. Those are all pretty straightforward, but you can also set which ones you prefer as the defaults as a way to customize it for your workflow. This is where the two groups come into play--when you're setting the defaults, you can set each group separately to work as a combination. The general behavior is that it remembers which options you last used, and the next time you zoom in or out it'll revert to that same type. So, for instance, if you used Fit and 1:1, it'll remember that for next time. Or maybe you used Fill and 1:4. You get the idea. The more you're zoomed in, the more limited your view is. So it's important to be able to move around the image. There are multiple ways to do this. The first layer depends on which method you use to zoom in. If you use the Z keyboard shortcut to zoom in, it'll zoom into the center of the image. Once you're zoomed in, there are more ways to move around. One is to click and drag the cursor in the main panel under Preferences > Interface > Tweaks. There's an option for "Zoom clicked point to center." It's a little hard to explain exactly how this behaves, so you might want to just try it for yourself. I prefer leaving it unchecked, but the option is there if you want it. Another is to click and drag the white box over the thumbnail in the Navigator panel. One nice feature is that you can preserve the zoom level and location between images. That comes in very handy when comparing similar images, for instance. Maybe you've zoomed in 1:1 to the eyes to see that they're sharp, and you're trying to find the best one. 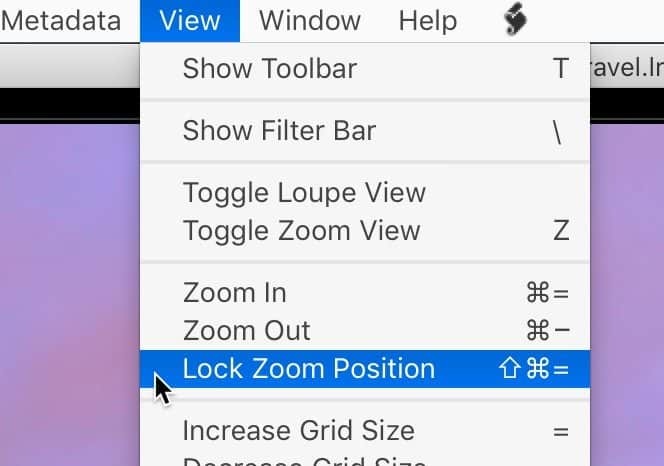 You can activate this under the View > Lock Zoom Position menu item. 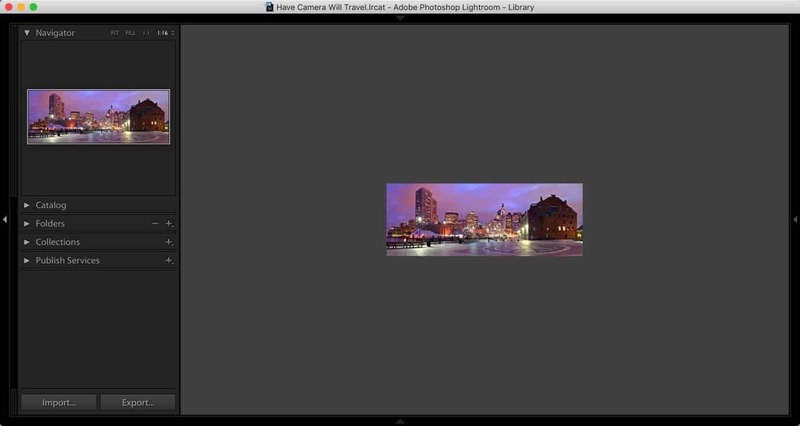 How do I zoom in on the side panel in Lightroom Classic. Would like it to show up in front as I have seen in many instructional videos. I have a iMac with an old Logitech keyboard. Sorry, but I don't follow what it is you're trying to do. Do you mean the right side panel isn't staying visible? If so, you can control which panels are visible by going to Window > Panels and then selection from the bottom half of those options (there are also shortcuts to access these). If you're trying to zoom in on the thumbnail in the Navigator panel on the left, you can click within the thumbnail and adjust the guides for zooming.